Put Intel’s Next Unit of Computing to work as a combo streaming unit, DVR, retro-gaming station, and more. Yeah, it’s cute—but this wee unit runs circles around your off-the shelf set-top device. If you hate a cluttered home-theater setup, put Intel’s Next Unit of Computing to work as a combo streaming unit, DVR, retro-gaming station, and more. fixed amount of space? Let’s not even get into the pitfalls of investing in something like the Ouya for emulated retro gaming. We certainly can understand wantingconvenience, but there’s no need to trade in the ability to pick your parts (and later upgrade them) to do so—not when you could use an Intel NUC as an HTPC. If you’re a fan of tiny footprints and want a rig that’ll do the job of a Roku 3 plus a ton more, but with less involvement than our July 2014’s Thin Mini-ITX build, we’ll walk you through the build as well as show you how to put it to work. Bonus: it’s simple enough that your more tech-savvy relatives can put one together on their own. 1.) This particular NUC supports up to 16GB of RAM in dualchannel mode; slide in the SO-DIMMs here. we put 8GB in our unit, but could upgrade down the road if need be. 2.) Insert the mSATA drive at an angle, then anchor it via a single Phillips screw. we picked an Intel 530 for this particular rig because it was handy, but any will work just fine. 3.) the mSATA drive, like in the first-generation of NUCs, sits over the wireless card. unlike the previous gen, you won’t need to worry about it overheating, though. 4.) 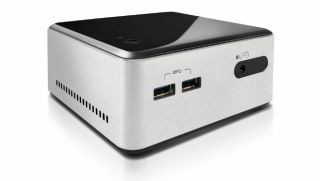 This double-decker NUC has a separate tray for a 2.5-inch drive. we grabbed an old 750GB drive, but will likely upgrade to a 2TB one later on. If you're a seasoned veteran of our more challenging Build Its, putting together this particular NUC will feel like child’s play. The only things that need to be added are an mSATA SSD, a mechanical hard drive, and RAM—that’s it. This second-generation NUC is a barebones kit that comes with a snappy Core i5-4250U dual-core CPU with Intel HD 5000 on-board graphics, and a pre-installed 802.11AC and Bluetooth 4.0 card. First, open the case by unscrewing the bottom panel’s four Phillips screws and then pulling it off. Set it aside, then gently pull up the 2.5-inch HDD tray and either fl ip it over or twist it off to the side to access the motherboard. We opted to install the RAM first—for this build, we grabbed two 4GB Crucial SO-DIMM sticks we had lying around. The NUC’s motherboard can accommodate up to 16GB, but we don’t think more than 8GB is necessary right now. Insert each SO-DIMM at an angle, then push the RAM down until it’s captured by each slot’s arms. (To remove, just gently pull on both of the arms with your fingernails or use a pen.) Next, slide the mSATA SSD at an angle into its slot (it’s positioned over the wireless card), then press it down and secure it with a single Phillips screw. We selected a 180GB Intel 530 for our mSATA SSD, which is a little roomier than our usual minimal requirement of 128GB However, we wanted a touch more storage space to use for games—partially because of the faster loading times, and partially because we’ll be dedicating the 750GB mechanical hard drive solely to DVR storage. Slide the 2.5-inch drive into its bay, and secure it with two screws. Replace the 2.5-inch HDD tray over the motherboard, taking care to seat it properly so the top of the 2.5-inch HDD lies flush with the lip of the chassis. Before putting the bottom panel back on, note the two circular notches on the side of it that’ll face the HDD tray. The one that isn’t a complete circle should be matched with the post that sits directly next to the mechanical hard drive, so that the panel lies flat when reattaching it. One note for system boot—for whatever reason, our NUC’s UEFI interface recognized the mechanical hard drive as the sole UEFI boot device, while the mSATA SSD and our external DVD drive appeared only under legacy BIOS boot devices. That made for some amusing moments when trying to boot to the DVD drive after our trial install of Windows 8. Our solution? We disabled UEFI boot devices altogether.